No matter how often I complain about how fast time is going, it never seems to slow down. How did it get to be the end of the year already? 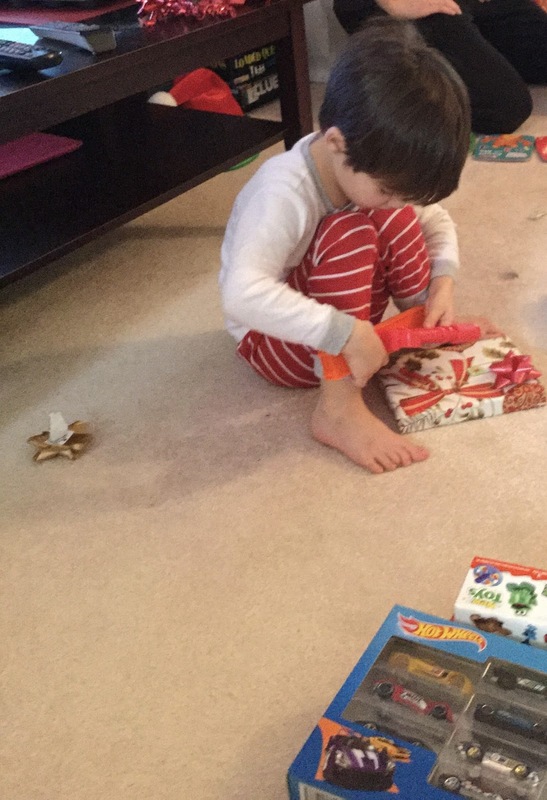 How can Christmas already be over? How can it be that this wonderful boy is on his way home again? We had such a fun time over Christmas. I was so sad to see him go, but thinking of his smiling face, happy giggle and non-stop talking keeps a smile on my face. If the weather permits, maybe we’ll see him again towards the end of January. I haven’t thought too much yet about quilting or knitting goals for the next year. I know I want to finish Northern Tree Line and the Large scale floral D4P Jannette and I have been swapping for the past year. 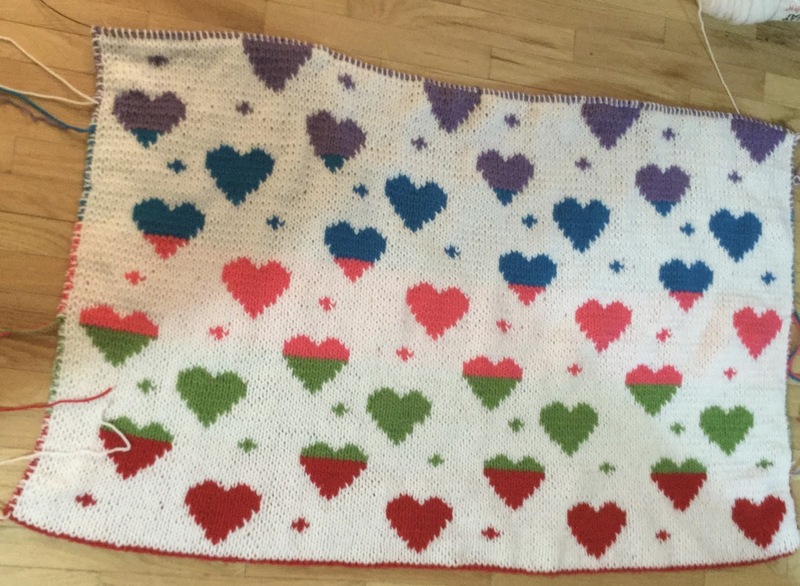 I have the Baby Love doubt;e knit blanket to finish. And I know I have curtains to make for the new baby’s room, and also some crib sheets which need to be done sooner rather than later. 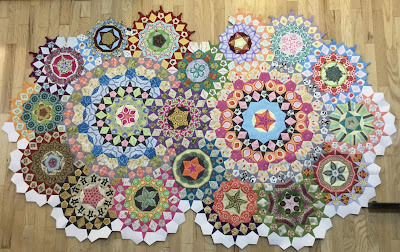 So, the lists on the side bar are going to remain as is for now, since the WIPs and UFOs listed haven’t changed all that much, nor have my Bucket List quilts changed. I have some rearranging of my sewing and quilting spaces that I want to do as well. Maybe I’ll get to that next week. I just wish it didn’t make such a mess in order to clean up. My final stash numbers for the year showed a total of 87.4 yards used. It’s normally much higher than that, but that number again reflects the time gobbling obsession with La Passacaglia. I added a total of 119.7 yards during the year. A lot of that was in the form of large scale florals for the swap and fabrics good for fussy cutting and Kona solids for La Passacaglia. 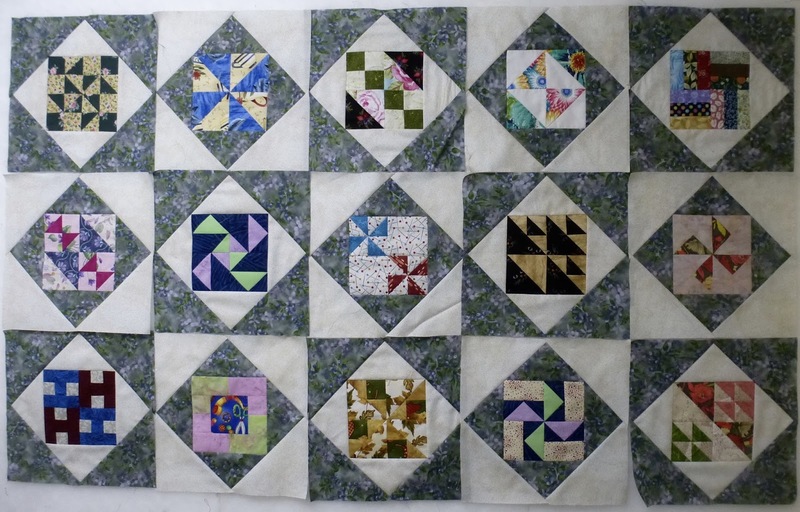 I have enough left of all of those for at least several more quilts. I ended up with a net stash added number of 32.3 yards. 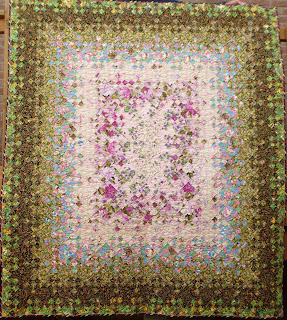 I’m thinking it would be fun to combine the large scale florals and the Kona solids into a basket quilt. And I’ve seen a gorgeous Clam Shell variation on Inklingo that would be perfect for this same large scale florals. I haven’t even thought of doing anything more than dreaming about that one. let alone adding it to a to-do list. I know I started last year saying something silly like I’d like to use up some of my scraps, which never ended up happening. I’d like to say I’ll do it this year, but with a new grandbaby coming into the house, I have no idea exactly what is going to happen. Some time in the next few weeks will be a post with an introduction to our grand daughter Abrielle. She’s due on the 12th. So, that’s it for the past year. It’s been a good one. Happy New year to anyone who had actually stuck out reading this far! There is absolutely nothing new on my design wall. Northern Tree Line and the LFQG Blog Sampler look exactly the same as they did several weeks ago. 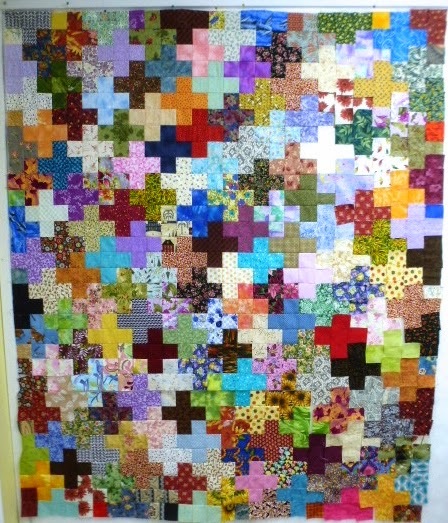 However, I do have one of my own quilts on the machine right now, and spent 3 or 4 hours today working on it. It’s a Great Granny Square that I pieced a few years ago, and then placed into the line up of my own quilts waiting their turn. I’m doing some very fun custom stuff on this one. After working on this for most of the afternoon, I came down and made supper and then sat down to watch my favourite Christmas Movie. A Muppets’ Christmas Carol. Of all the version of this movie, and characters, it’s my favourite. I think Michael Caine did a great Scrooge. 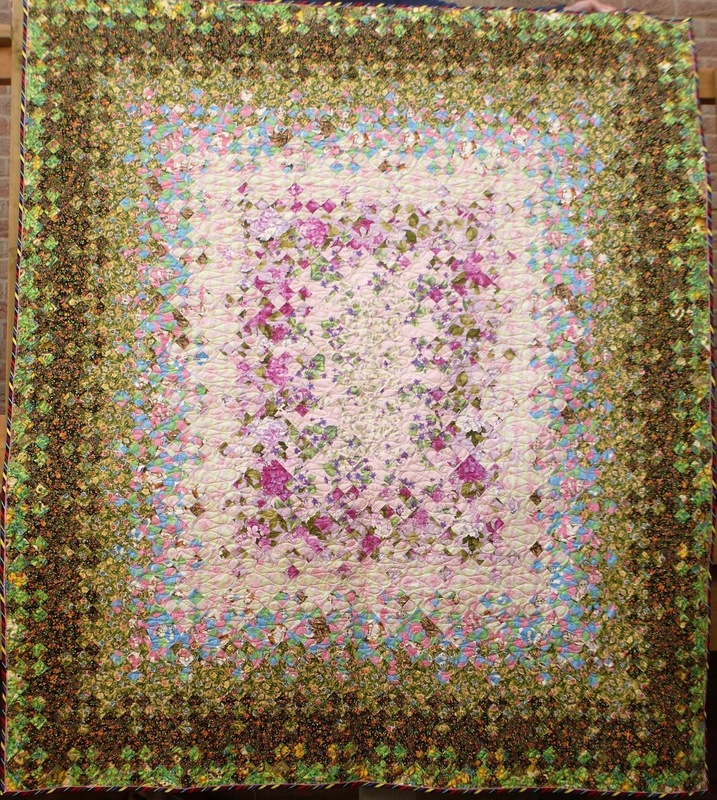 While watching that, I stitched on a few more fillers to La Passacaglia. Once I finish this, I think I’ll switch out to knitting. I’m linking up to Judy’s Design Wall Monday. I’ve finally had some movement in my stash. 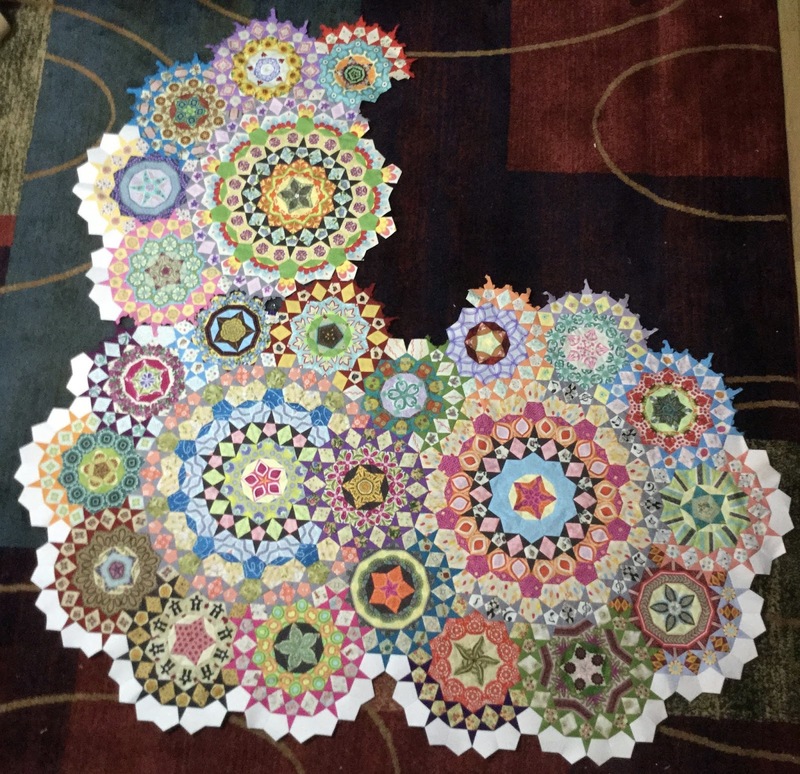 I used some this past week to make a backing for a quilt, and also cut some more white to keep on going with the fillers around La Passacaglia. However, the use was cancelled out and then some with some intake. Some of it is really pretty large scale florals that just might make it into the backing of my large scale floral Disappearing Four Patch swap blocks. I’m thinking they’ll be the first project put together in the New Year. I’ve been working on La Passacaglia today, glue basting more white filler pieces for around the outside edge. I’ve gotten some sewing done on it, too. I’ve started on the top left section now. Just three more rosettes on that section to put white around, and then I can start on the top right section. It gets closer to a finish with each week that goes by. After all the white filler pieces go on comes the next decision, what to do with it next. The original thought is to appliqué it down to white borders. But looking at it here, laying on the dark carpet, I kinda like how the dark makes the rest of it stand out. Oh well, I have quite a long while before I have to decide that. What I need to do is get out a couple of lengths of white and try it out. This is the lowest amount of fabric that I’ve used in years, I think. And I suspect a lot of that is caused by my obsession with La Passacaglia. It’s taken up so much of my time that I would ordinarily have spent machine piecing quilts, rather than the intense hand piecing this has taken. But I don’t regret on single second spent on this project. It has been enjoyable all the way through. I’m linking to Judy’s Stash Report and Kathy’s Slow Sunday Stitching. Then it’s back to more stitching. 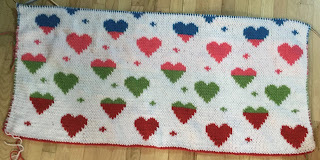 It’s still the Baby Love Double Knit Blanket, found here on Ravelry. 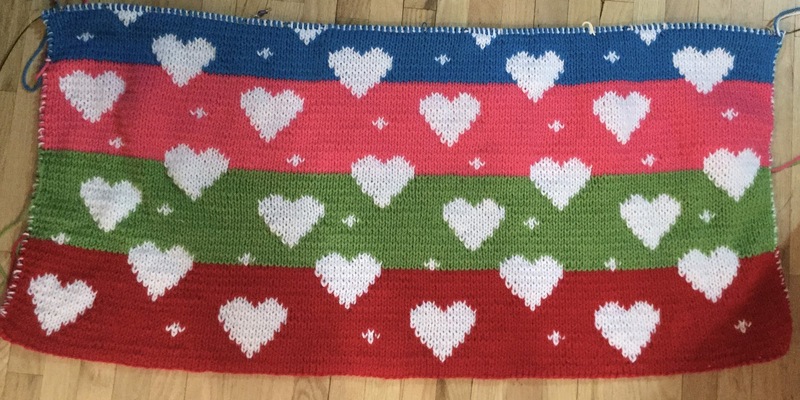 The blanket is now officially half finished. I just did the last row of the purple last night. Tonight begins yellow, and then the first four colours repeat. I am trying really hard to stay focused on this so I can get it done. There are so many other cute projects that I want to do, Have you seen the cute little animals out there? Look at this sweet Giraffe. It would be so cute made from the same colours as this blanket. How about this cute little sad eyed puppy dog, or this elephant. There simply aren’t enough hours in a day or days in a life time to do all the wonderful fun things and patterns available. I’m linking up to Judy’s On the Needles, and then I’m going to find something to eat and something to watch on TV, well actually closer to listen to on TV, while I do some more knitting. I’m doing more on La Passacaglia today. I’ve almost finished putting the white fillers around the bottom half of this quilt. I also sewed the rosette with the light orange stars into place on the left hand side today. All that’s left is to sew a few more whites onto that light orange rosette and the burgundy one above it, and then I can move onto adding them to the two top sections, not pictured here. This process is going much faster than I thought it would. Then I have to figure out what I’m doing with the border, beyond putting it onto more white. At this point, I’m not sure I want to add on any colour to the outer edges. I want to keep all the focus on what’s going on in the centre. But that could change. Maybe a narrow border of the same dark grey I used in the centre of all the large rosettes. I won’t know that until the whole thing is finished. 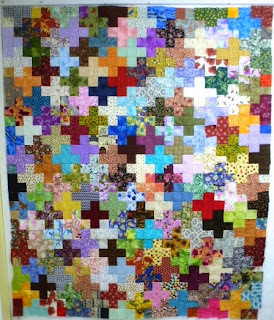 So, with that in mind, I’m linking up to Kathy’s Slow Sunday Stitching, and then going back to do a bit more on this. I’m not bothering with a stash report again this week. There hasn’t been any movement in either direction. I’m going to have to cut some more white to make some more filler pieces for this project, so I might be able to count a small amount out next week. I’m continuing to work on the Baby Love Double Knit Blanket. 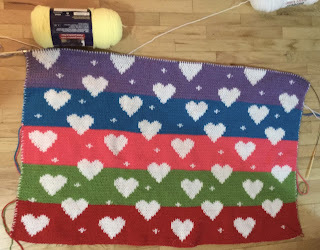 I added on the fourth colour on Wednesday, and am 10 rows away from adding in the next one. Each colour runs for 25 rows. 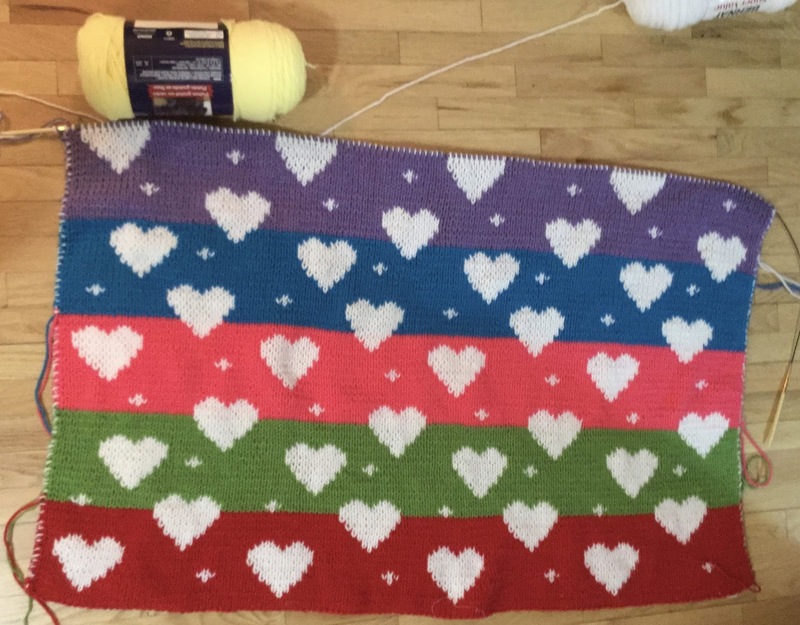 There are 11 total colour blocks or stripes, and I’m only four in, so there’s quite a way to go yet. But each time I do the pattern repeat, it gets faster. I’ve gotten to the point where I can recognize where I am on the chart, which helps a lot. 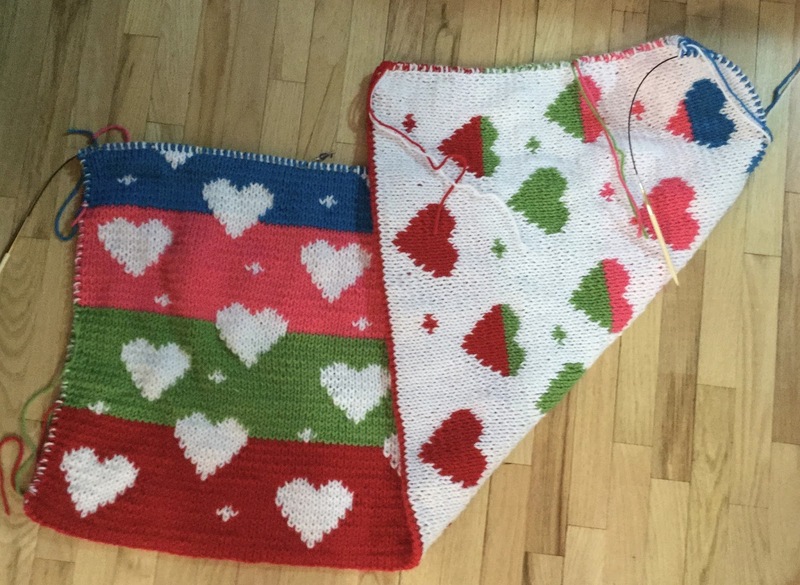 At first the double knitting was very confusing to look at and to figure out. I’m so glad I stuck with it, though. This technique would make such a wonderfully warm pair of mittens, or a two coloured sweater. However, all other knitting projects, or even plans, are on hold until this is done. I’m linking up to Judy’s On the Needles, and then it’s back to knitting. I’m continuing to work on putting white filler pieces around the bottom section of La Passacaglia. It’s a slow process, and not too terribly exciting, although I do really like the way the white is making the colours of the stars shine out. I think you’ll have to biggie size the picture though, in order to see it. Right now looking at the picture, all I’m seeing is white. But that might be because of the contrast with the floor. Today I’m hoping to get the white sewn to the dark grey and the red star points. There’s a rosette that has to be sewn into place in that large gap between the red and the burgundy star. 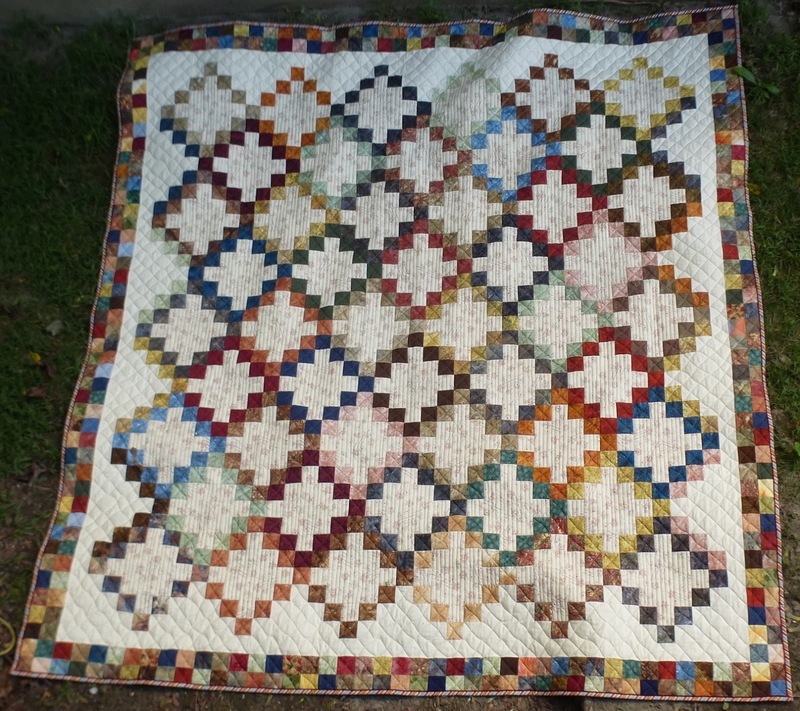 Once that is done, I can add in more of the white, and that will finish the fillers on this half of the quilt. I’m not exactly sure just how much of this I’ll get done today. It’s our family get together for decorating the house and the Christmas tree today, along with dinner and munchies. But I might be able to get some done before they get here. The roasts are thawing out, and just need to be put into the oven. And there will be hands other than mine to do the potato and vegetable preparations. So I should be able to get a couple of hours that I can dedicate to this. And I can also stitch while visiting. I’m not going to bother with writing out a stash report this week, since there hasn’t been any change since the last one. 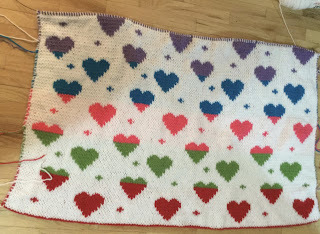 I’m linking up to Kathy’s Slow Sunday Stitching and then it will be stitching time. 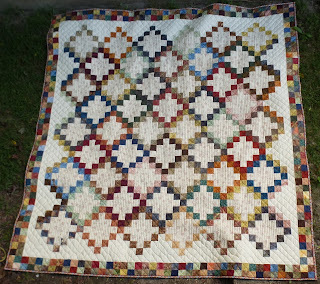 There hasn’t been a whole lot of quilty stuff done in the last few days. We had a wonderful visitor this past weekend, our grandson Avery. He is very well behaved, easily amused, plays well by himself and with others, and talks non-stop. And when he wasn’t talking, he was singing to himself and he has the typical four year old boy’s love of silly noises. I spent a lot of time smiling and laughing while he was here. There was a little bit of knitting time after he went to bed on Saturday. And then I did a blitz of knitting and stitching on Sunday after he left at about 3 in the afternoon. Between the stitching and knitting and watching Call the Midwife on Netflix, I kept my mind occupied while Noel drove Avery the 3 1/2 hours to get him home and then another 3 /12 hours to come back again. 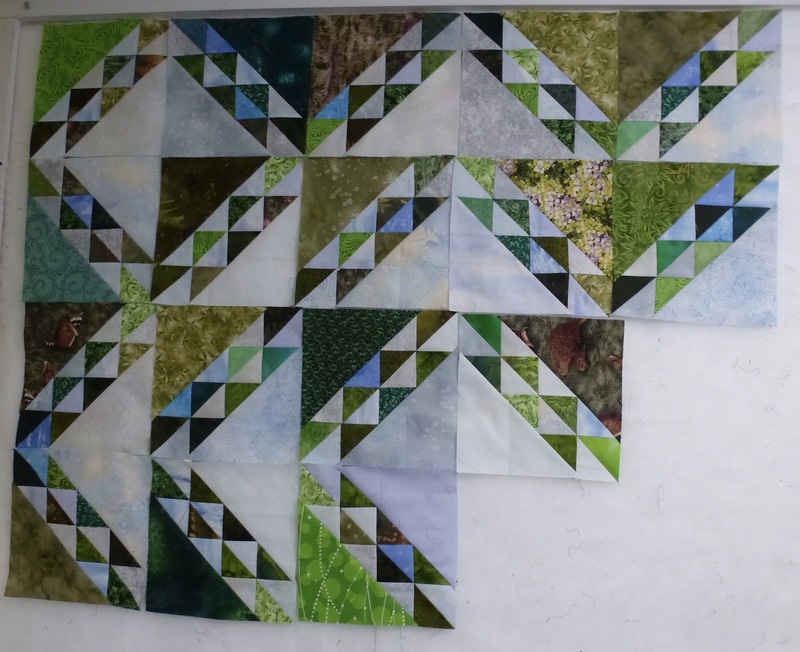 I did make a little bit of progress on my Northern Tree Line quilt on Friday. It’s going together quite easily, in between other things, since I’m using it as a leader/ender project. 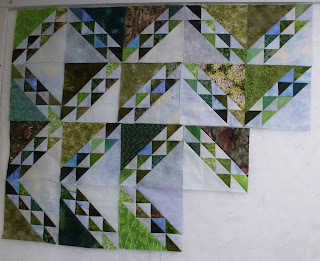 It’s amazing how many half square triangles can get sewn together while making sampler blocks. I got three more blocks done for the London Friendship Quilters’ Guild Blog Sampler. This now takes us up to the end of April. I got them written up and scheduled for their publishing dates today. It’s free and anyone interested can follow along. And that’s about all that’s been going on here.